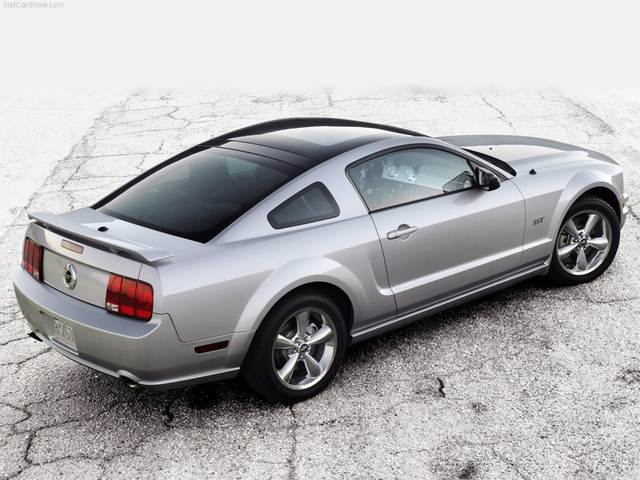 A stellar engine and transmission package in the manual V8 and phenomenal handling come together to make Ford's 2009 version one of the most enjoyable Mustangs to drive in this last year of the current incarnation. They've had four years and loads of complaints, but Ford still hasn't addressed the interior fit and finish issues in the Mustang, proving that the bean counters always win. Despite what sales would leave you to believe, there’s only one way to make a Mustang, and that’s with a manual transmission and a big V8. That means your only choices are what color, and whether you want to see the sky over your head while you drive. Collectors are sure to grab up a few of the last model year of what might be the greatest generation in Mustang history, but otherwise, you might want to wait and see what 2010 has to offer. The Ford Mustang has been in production for forty-five years, the longest continually produced pony car and the only example that has been in production since its inception. With that in mind, it’s older than most drivers behind the wheel. Now in its fifth generation, this 2+2 sports car was introduced in 1964 and immediately became Ford’s greatest success story since the Model A put America on the road. 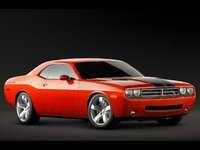 Since then, it has gone from pony car to muscle car to economy sports car and back again. This latest incarnation takes many visual cues from the first-generation Mustangs, and it has the performance to back up that legacy. With two engine options across eight trims, the Mustang is one of the last true sports cars with the engine up front, and the power out back. Before rear-wheel drive goes out of style completely, there’s still the Mustang. Consumers can choose between the Deluxe and Premium trim levels in either Base (V6) or GT (V8) and coupe or convertible configuration. Base models get a very formidable cast-iron block 4.0-liter V6 that produces 210 hp. This sounds puny in comparison to the Mustang’s further offerings, but it must be remembered that 210 hp outperforms quite a few V8s in the Mustang’s long history. The real attention, even if sales don’t usually reflect this, always goes to the GT’s V8 powerplant. Unchanged from last year, GT trims enjoy an aluminum-block, 4.6-liter, 24-valve modular V8, which utilizes Ford’s Variable Camshaft Timing. As in previous years, it’s good for 300 hp at 5,750 RPM and 320 lb-ft of torque at 4,500 RPM, which adds up to a 0-60 time very near 5.0 seconds flat. That’s fast. Even the V6 can make the same run in less than 7 seconds, which is fast in its own right. With around 175 extra pounds, expect convertibles to be slightly slower, but there’s a lot to be said for being able to make those runs with the top down. Automatics have been criticized as sluggish in downshifting and general response, but the Tremec TR-3650 manual has been widely praised as a welcome upgrade from the T-5. 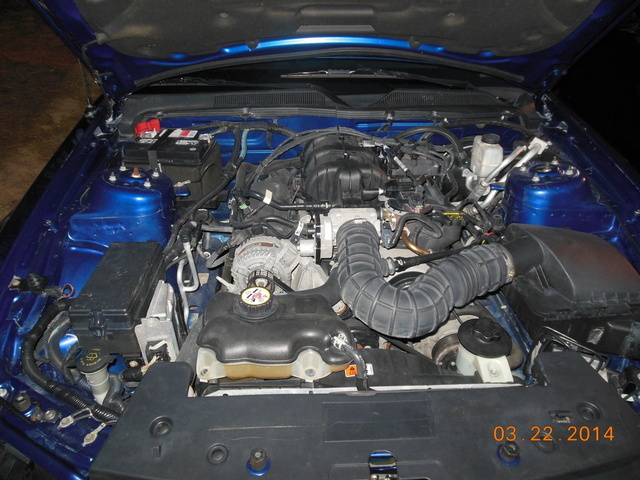 EPA estimates show 17/26 mpg for a manual-equipped V6 and 16/24 with the automatic. GT trims are only slightly lower at 15/23 for a manual V8 and 15/22 for the automatic. While there is substantial difference in the ride and handling of the V6 compared to the V8, it must be said that the V6 still provides a compliant and comfortable ride. No one would label the V6 as particularly sporty, as it has a hint of excessive body lean in corners and wallow over uneven surfaces, but it’s not bad by any means. The GT, however, seems to absorb corners with ease through pleasantly neutral steering. 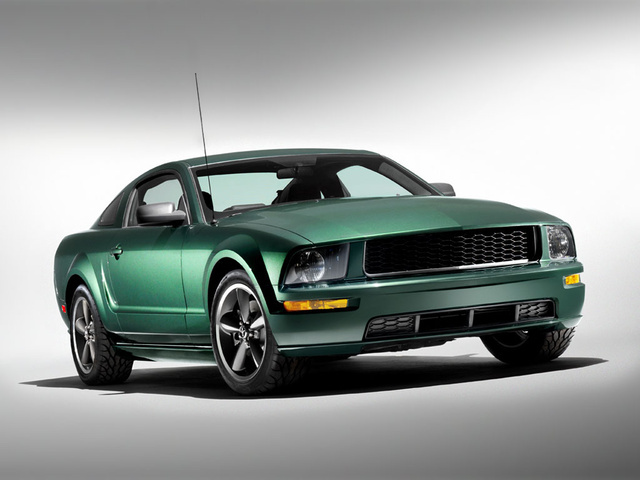 Pay attention to pavement breaks in corners, as this Mustang has handling that can make you forget that you’re still traveling on a live rear axle, which has the potential for frog-like antics. Pedal feel is exceptional, with good stopping power. 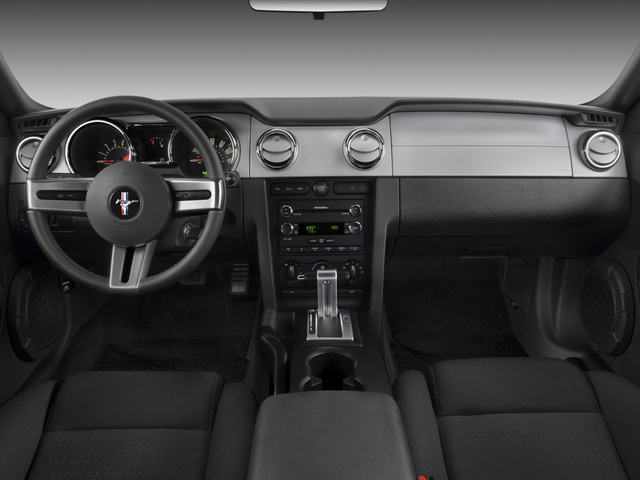 Sadly, the cabin of the Mustang can best be described as form winning over function. The interior looks quite stunning, with its chrome-rimmed gauges and retro-themed markings, but falls short upon close inspection. The shifter gets in the way of both the cupholders and the navigation screen, depending on gear, the levers and switches have a distinct “cheapness” of feel in operation, and the over-abundance of hard plastics and uneven joints even in the GT is unacceptable for a car that pushes thirty-five grand at retail. Squeaks, rattles, and vibrations are prominent, in both coupes and convertibles, but wind noise is kept well in check. The front seats are quite comfortable, although taller drivers my find knees jammed between the steering wheel and door when operating the clutch. It’s long been understood that the additional “2” in “2+2” was at the very least parenthetical. This has remained unchanged in recent years, as the entire backseat experience of the Mustang can be honestly described as painful. Entry is painful. Exit is painful. Sitting is painful. It’s just very simply not made for adults. Storage space in the trunk is quite impressive, although the opening leads to Tetris-like insertions of anything but smaller packages. Visibility is much better in coupes than in convertibles, where blind spots at the rear call for head turning while changing lanes. Watch for rather pleasant intrusion of engine noise with the V8, but some raggedness in the upper RPM range of the V6. With only standard dual front and front side airbags, four-wheel disc brakes, and a tire pressure monitor, the Mustang shows that safety doesn’t have to be complicated. The coupe garnered five stars in all NHTSA tests except side impacts involving the rear passenger, which received four stars. The convertible, however, scored five stars across the board, partially due to structural reinforcements. GT trims additionally get antilock brakes as a standard feature. Many have commented that the modern incarnation of the Mustang goes a long way toward dispelling the almost automatic assumption that an independent rear suspension is better than a live rear axle. While wheel hop can be induced, it takes effort, and usually a hard corner with an uneven surface. Straight-line acceleration has always been the Mustang’s forte, however, and this model is no exception. With the base V8 skirting the edges of a 5-second 0-60, there are two additional trims with even faster powerplants, keeping owners very happy. The interior, on the other hand, leaves many feeling cold. Too many hard plastics and not enough attention to detail have a lot of owners wondering where their money went. 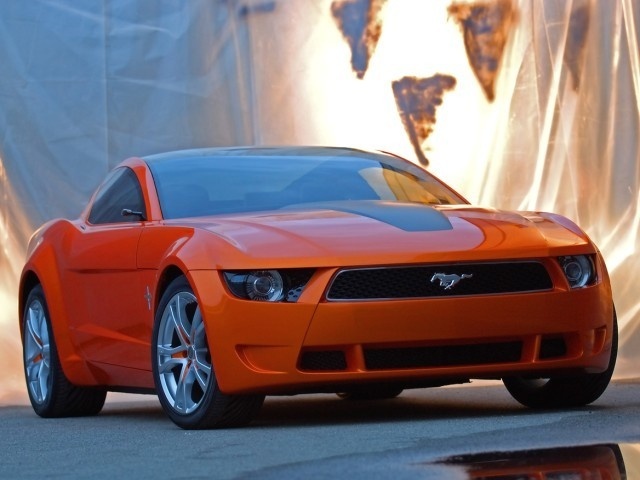 What's your take on the 2009 Ford Mustang? TheHorror You're dead wrong, Perkins. Elitist "journalists", like you, should refrain from projecting your narrow perspectives from the larger public. Enthusiasts do not matter to the market. 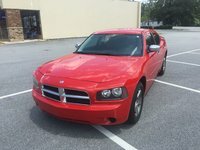 Users ranked 2009 Ford Mustang against other cars which they drove/owned. Each ranking was based on 9 categories. Here is the summary of top rankings. 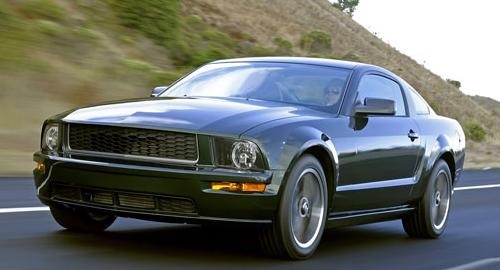 Have you driven a 2009 Ford Mustang?